Samsung, the current world leader in memory chips, has announced that it has increased the production of 8GB HBM2 memory chips. HBM2 (second-generation High Bandwidth Memory) chips are used in high-end computers and servers for artificial intelligence, advanced graphics, high-performance computing, and network systems. HBM2 offers a data bandwidth of 256GB/s, and is currently the fastest type of DRAM chip. These chips are being used in high-end graphics cards from AMD and Nvidia. Samsung isn’t the only company making HBM2 chips, though. 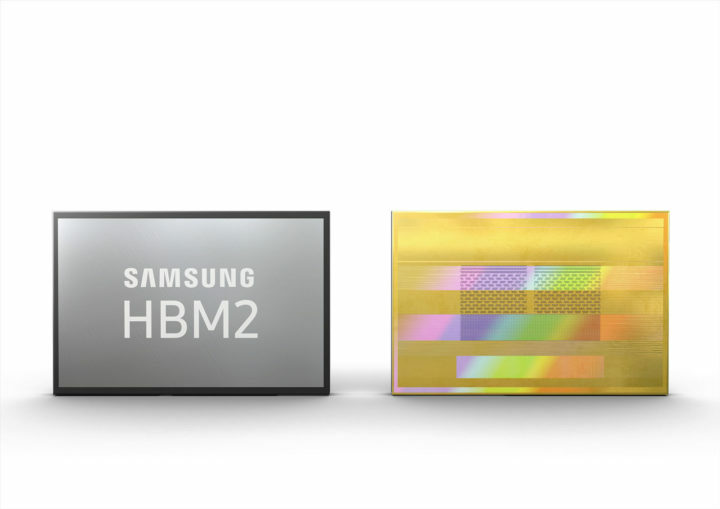 SK Hynix makes HBM2 chips as well, and Samsung says that its 8GB HBM2 chips offer the best energy efficiency, performance, and reliability in the industry. It uses eight 8Gb dies and a buffer die at the bottom of the stack. The whole package has over 40,000 TSVs (Through Silicon Via), ensuring high performance by making sure that data flow doesn’t get interrupted. They also prevent overheating to improve reliability. “By increasing production of the industry’s only 8GB HBM2 solution now available, we are aiming to ensure that global IT system manufacturers have sufficient supply for timely development of new and upgraded systems. We will continue to deliver more advanced HBM2 line-ups, while closely cooperating with our global IT customers,” said Jaesoo Han, executive vice president, Memory Sales & Marketing team at Samsung Electronics. Samsung had introduced its first HBM2 chips back in June 2016 with 4GB memory, and the new 8GB chips offer eight times the data transmission bandwidth compared to GDDR RAM chips. The company anticipates that its 8GB HBM2 chips will cover more than 50 percent of the HBM2 production by the first half of 2018.